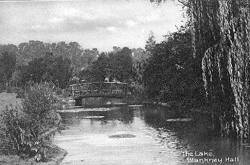 The Blankney estates had been the property of the Deincourts since the Norman Conquest. In the fifteenth century, it passed through the marriage of an heiress to the Lovels of Titchmarsh. All the estates of the Lovels were confiscated for the crown by Henry VII after the battle of Stoke Field in 1487. Blankney was bought by the Thorolds, who did much to embellish the house with the fine carved panelling of the period. But in the reign of Charles I, through a marriage with the Thorold heiress, it passed into the hands of Sir William Widdrington who was created Baron Widdrington of Blankney in 1643. Lord Widdrington's great grandson had the indiscretion to take part in the rebellion of 1715. He was captured at Preston, convicted of high treason and his lands were confiscated in the following year. 3 years later, in 1719, Thomas Chaplin bought Blankney from the Commissioners of Confiscated Property. He died in 1747 and the estate passed to his son, John and remained in the family until 1897 until mounting debts forced Henry Chaplin to sell it to Lord Londesborough. Henry Chaplin was perhaps the most colourful of Blankney Hall's owners. As the owner of a derby winner and Britain's first Minister for Agriculture, he lived life to the full. Blankney Hall was used to billet servicewomen during the last war. 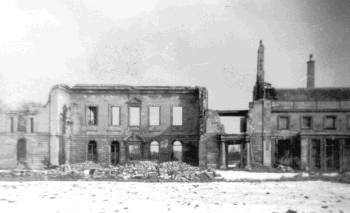 Badly damaged by a fire in 1945, Blankney Hall was an empty shell when it was finally demolished in the 1960s. Now nothing remains of a once great hall except the woefully neglected stable block. This gallery contains additional photographs of the outside of the Hall and its grounds. This English Heritage page contains some interior photogrpahs.